Two days before the February 5 volmageddon, and before everyone became an overnight expert on inverse VIX ETFs, CTAs an risk parity funds, we showed two chart which we explicitly said presaged a turning point for markets, vol-targeting funds, and hinted at an imminent risk-parity tantrum. 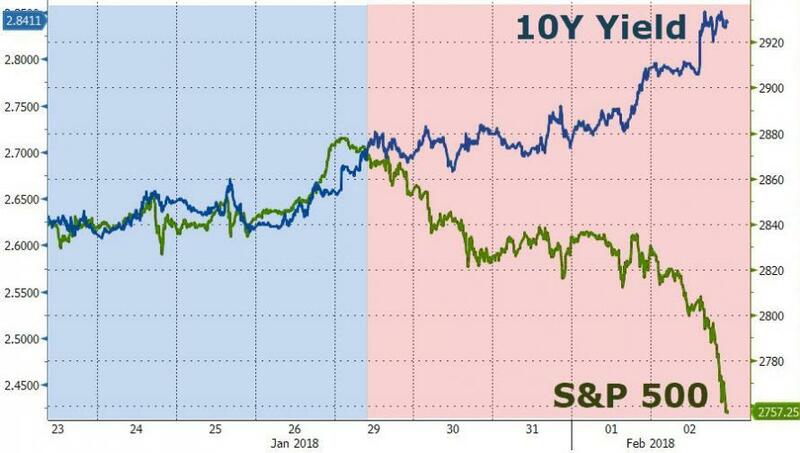 The first showed the unmistakable correlation shift between 10Y yields and the S&P, which we said is "considerably worrisome for investors." Meanwhile, we also showed that the bond-equity correlation, which has been predominantly negative since the Lehman crisis, had started creeping up towards positive territory. 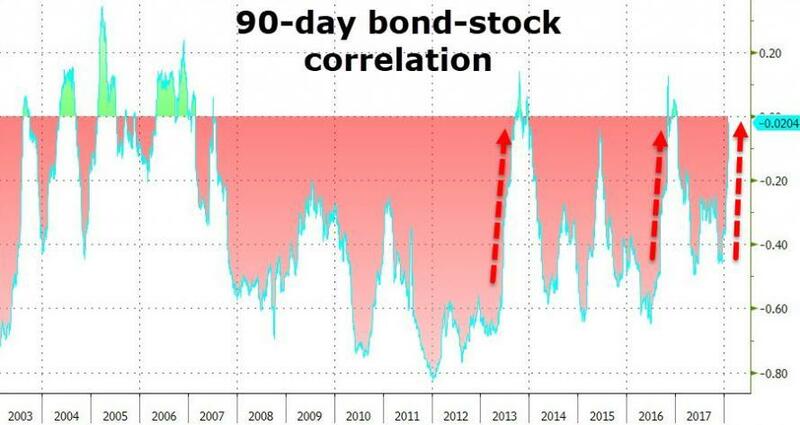 Specifically, we said that "the 90-day correlation between stock (SPY) and bond (TLT) markets has surged ominously in the last few weeks." Three weeks later, Bank of America - in response to "many interest rate questions from investors" - published a 50 page report which looks at the relationship between rising rates and stocks to conclude, after tortured and convoluted logic and several goalseeked examples, that rising rates are not bad for stocks. Actually, they are, and here is the simplest reason why in just 9 words: "Every market crash has been preceded by Fed tightening." Over the past 64 years, stocks have exhibited a weak and inconsistent correlation with interest rates (-11%). Over this period, the correlation has seen a wide range from -63% to 75%. The relationship was generally negative for most of the 1960s through the 1990s (higher yields bad for stocks), a period during which the average level of rates was 7.5%. But since the turn of the century, the relationship was generally positive (higher yields good for stocks) a period during which the average level of rates was 3%. The relationship with rates and stock returns peaked about five years ago, but has remained positive and has been trending higher since the recent trough of 13% in late 2015 (Chart 2). 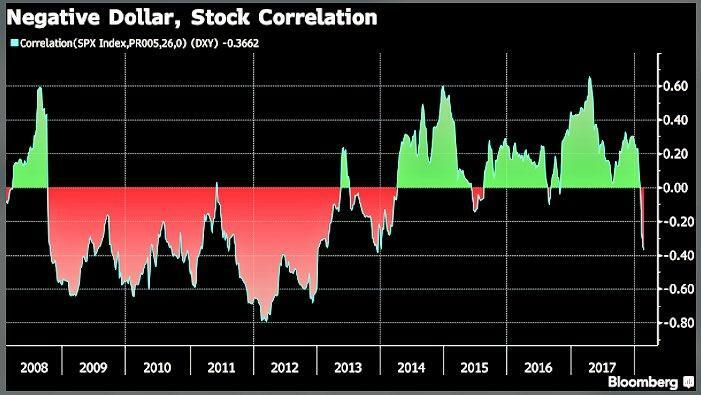 And now it's flipped again... and it's not the only one: as the following bloombergchart show, the 6-month rolling correlation between stocks and the dollar, which was also positive for the past 4 years, has turned sharply negative. 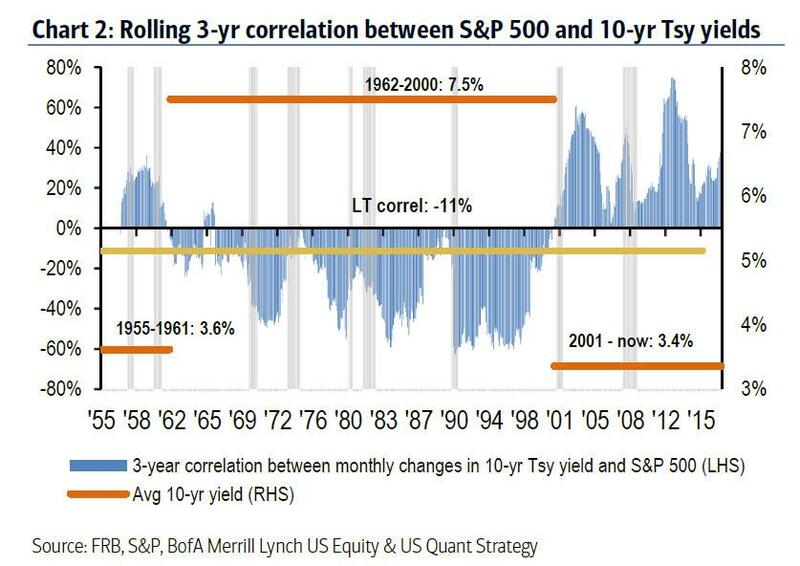 So why is this (or rather these) most critical market correlation inverting as yields creep ever higher? Overnight, Blackrock's Russ Koesterich gave an elegant explanation, highlighting three things: i) the reversal in the correlation sign, ii) the nonlinear relationship between the two key asset classes, and iii) the relative interest rate. Financial theory does suggest that equity valuations, i.e. the price you pay for a dollar of earnings, should drop as the interest rate used to discount that earning rises. Empirical evidence supports this. 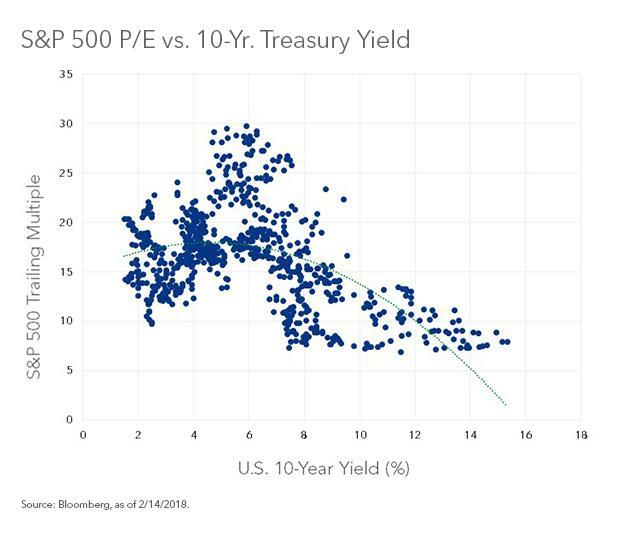 A simple linear regression of stock multiples versus interest rates demonstrates that over the very long term, rates and market multiples are negatively correlated. 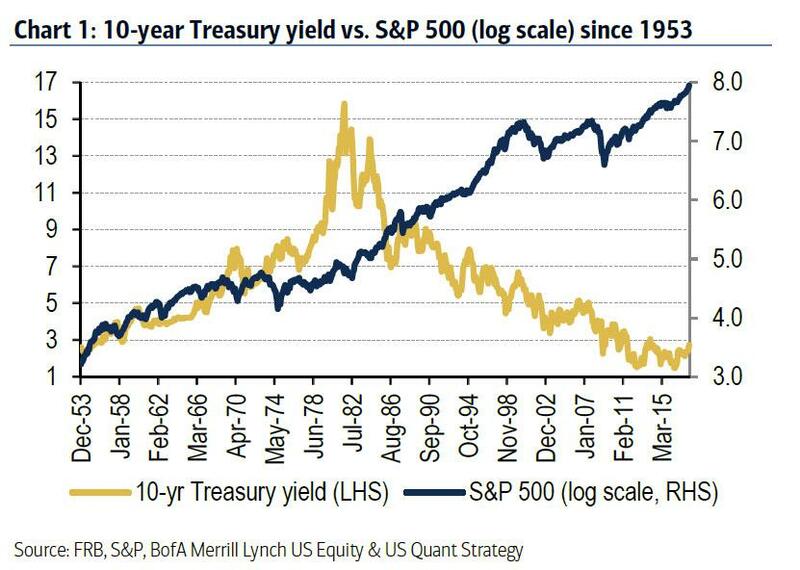 Since 1954, for every one percentage point increase in 10-year Treasury yields the price-to-earnings ratio (P/E) on the S&P 500 contracts by approximately 0.70 points. 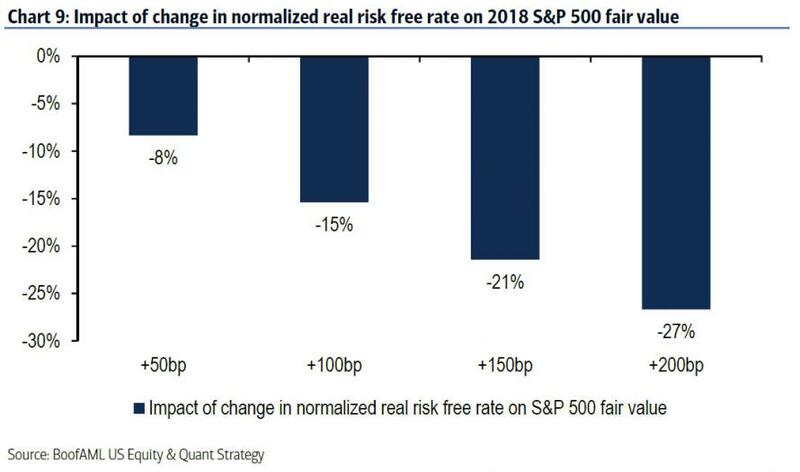 Another way of showing this is the following chart from BofA which shows the impact of the change in the real risk free rate on S&P fair value. The higher rate, the lower the S&P, or as BofA explains, "every 50bp increase in the normalized real risk-free rate reduces the fair value of the S&P 500 by roughly 6-8%"
However, if you allow for a more complex expression of the relationship, things look somewhat different. 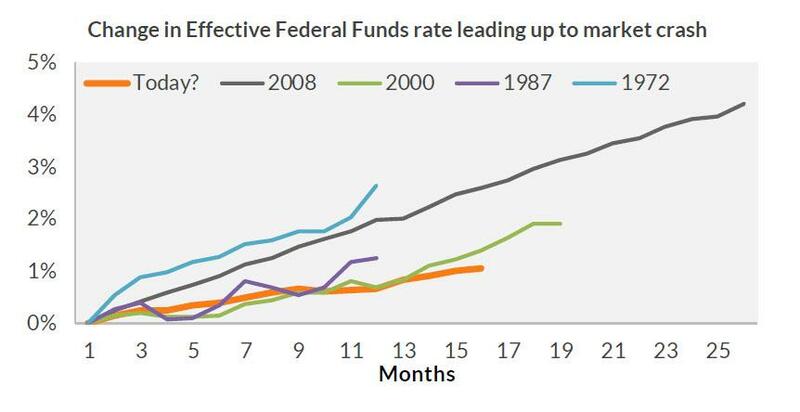 Rather than a straight line, a better description of the relationship between rates and multiples is nonlinear, i.e. the relationship changes depending on the level of rates. Allowing for this nuance, interest rates explain nearly 30% of the variation in S&P 500 earnings multiples (see the accompanying chart). Rates and multiples are more likely to rise in tandem when interest rates are rising from unusually low levels, as is the case today. Under these circumstances, faster growth is treated as a positive as it alleviates recession and deflation fears. In addition, faster nominal growth is also associated with faster earnings growth. Unfortunately, there is a caveat. Rates and valuations can rise together—to a point. 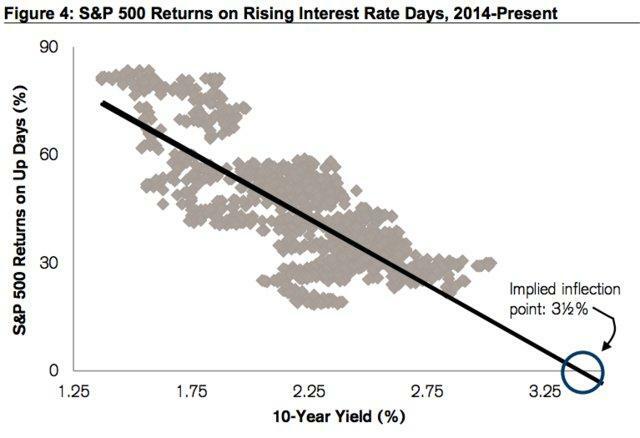 At some point the negative relationship between rates and valuations reasserts itself. In other words, at a certain level higher bond yields create real competition for stocks, particularly dividend stocks, and put downward pressure on multiples. What that point is, is of course the $64 trillion question: while some have suggested 2.75%, some 3.0% the latest and greatest estimation of this inflection point came from Credit Suisse this week, which calculated that the day of reckoning for stocks will take place just as the 10Y yield hits 3.50%. Of course, by the time the 10Y actually does hit 3.5% it will be far too late as anticipating traders will have been busy frontrunning this event... and selling; it explains why the closer we get to 3.00%... or 3.50%, the greater the divergence between the 10Y and the S&P, and why the higher yields go, the more negative the correlation, until it eventually snaps back when stocks finally capitulate and the next crash hits.